If I could give her more than five stars, I would. She was so fantastic!!!! Money well spent and she made our wedding ceremony SO beautiful. This harpist is THE real deal. She was EXCELLENT! She was very easy to work with.... very accomadating and extrememely talented! I will recommend her to anyone needing or even thinking about needing a harpist... WELL WORTH the money!! Claire is talented and crowd pleasing. Willing to accommodate our date and time. Excellent communication from start to finish. Claire is a Beautiful lady with a personality people fall in love with. I highly recommend her to any event. Thank you Claire, for making a memorable evening for our friends. Claire performed beautifully for our gallery opening. We asked her to play a variety of musical genres for our event and everyone enjoyed her musical selections. I can't say enough about how pleased we are. 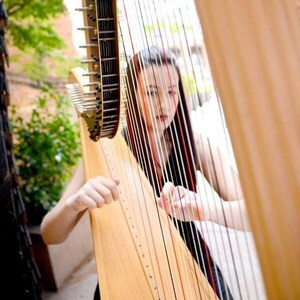 Claire is a very talented musician and her playing the harp gave our event an elegant touch. Everyone loved having her. I highly recommend Claire to play for your event. Claire was professional and extremely accommodating in our selection of songs. She was very enthusiastic and even learned a new song for our special day! Everyone loved having her play during our ceremony! I would highly recommend using her for your special event! Claire is incredibly talented and very easy to work with. From the beginning she was very professional and accommodating to our requests. Claire is very helpful and knowledgeable. The amount of songs she knows and is willing to play is impressive. She is also willing to learn new songs upon request. We are so thankful that Claire was apart of our special day. Claire was amazing! She was very accommodating and was proactive in making sure we had every selection needed to make our day special. She performed beautifully. She was very accomodating to all my wishes. Had a great personality and sense of humor. She also responded quickly. After the wedding my husband looked at me and said now I understand why you wanted a harp that was beautiful! I would recommend her to everyone. Claire is absolutely fantastic! Everyone enjoyed her music - it really set the tone for a romantic Valentine's Day dinner! We look forward to having her back again in the future! Claire was a true professional and a real pleasure to work with during the wedding process. She made it easy, but also enjoyable when it came to music selection during the wedding ceremony. Quality and customer service are very important to her, which reflected in the outcome with many positive remarks from our guests. The wedding process can be a stressful one, but when you have a vendor who is easily accessible, helpful, and truly cares to make your event memorable and personal, Claire demonstrates that in every way. Claire was wonderful! She took the time to find new sheet music for the requests I had and learned the songs to make my day wonderful. Our wedding guests all enjoyed her music and talent! I recently booked Claire to play at my wedding ceremony. She was so wonderful to work with before the wedding and even better at the wedding! Claire consistently checked in with us, provided suggestions for music and even offered to learn a new song, if that's what we wanted at our ceremony. She's very talented and professional. My ceremony was so beautiful, thanks to the incredible harp music! I highly recommend her! Claire was absolutely amazing. She was very easy to work with. She plays beautifully. What a special treat for our guests. Highly recommend. The music was beautiful! Thank you for playing at my wedding! Although I didn't get to fully meet you (LOL), you did a wonderful job! Everyone loved it!! :) Thank you again!!!! Claire exceeded our expectations in her overall performance and professionalism. We continue to receive compliments about her performance from guests that attended the wedding. Having a harpist was one if the best decisions we made when planning our wedding and Claire was the perfect person to make this dream come true. Thank you, Claire for sharing your exceptional talent with us on our wedding day.